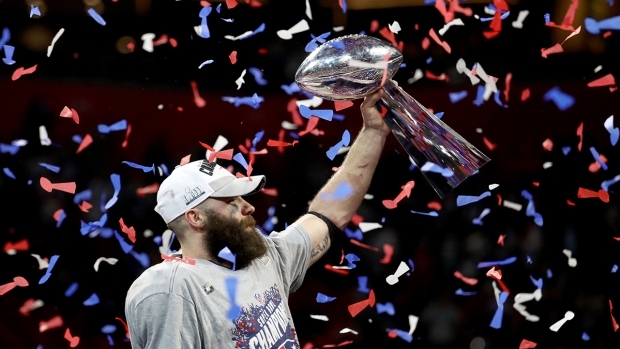 The 2019 Super Bowl was watched by the fewest people in 11 years, according to preliminary ratings figures from research firm Nielsen. The CBS broadcast of Sunday's game between the Los Angeles Rams and the New England Patriots was watched by about 98.2 million people, Nielsen said late Monday. Those figures are the lowest since 2008, when 97.5 million tuned in. The Patriots won 13-3 in the lowest-scoring Super Bowl in its 53-year history. Ratings have fallen for the fourth year in a row: Last year, 103.5 million watched the NFL championship game, down from 111.3 million in 2017 and 111.9 million in 2016. Viewing figures peaked in 2015, when 114.4 million saw the New England Patriots beat the Seattle Seahawks 28-24. Nielsen also said that 67 percent of U.S. homes with televisions in use were tuned into the broadcast on Sunday, compared with 68 percent in 2018. Even though viewing figures went down, the cost of a 30-second ad spot during the big game broadcast increased. Super Bowl ad spots are the most expensive on commercial TV in the U.S. by far, with a 30-second slot on CBS costing $5.25 million this year. That's up slightly on the $5.2 million charged by NBC for ad spots in last year's game.